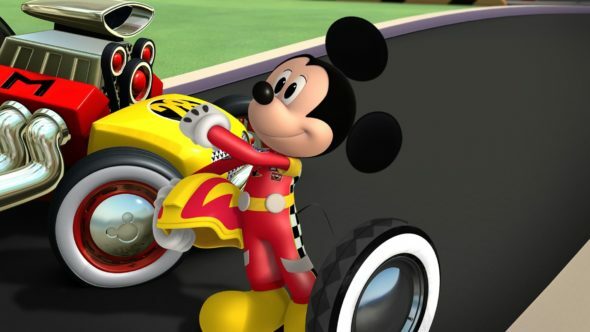 Don’t worry about the mouse getting cancelled, Disney Junior has just renewed its animated Mickey and the Roadster Racers TV show for a second season. The first season of the young children’s series just premiered on January 15th of this year. Real-life racers Jimmie Johnson, Danica Patrick, and Jeff Gordon recurred in season one of Mickey and the Roadster Racers , as did Jay Leno, Tim Gunn, Hoda Kotb, and Gordon Ramsay. Peter Serafinowicz, Jane Leeves, Fred Willard, Hector Elizondo, Tony Shalhoub, Kate Micucci, Tia Carrere, and Patton Oswalt guest starred. What do you think? Has your family been watching the first season of the Mickey and the Roadster Racers TV series? Will you check out season two on Disney Junior? Let us know, below.